WINTHROP — At first, Cam Wood stood out in Winthrop’s starting lineup because of his imposing, 6-foot, 8-inch frame. As his sophomore year unfolded, however, Wood stood out for his vital contributions to the Ramblers’ Class C South championship run. Now a junior, Wood’s role in Winthrop’s success is only growing. Now he not only stands out as the biggest guy on the floor, or as the lone returning starter from last year, but also a leader as the Ramblers prepare for the postseason and try to become the first Winthrop team to win back-to-back regional titles since 1992-93. Although he jokes he had little choice in the matter, Wood showed he can handle holding others accountable by holding himself accountable first, getting into better condition during his freshman year so he could keep up with the Ramblers’ breakneck style of play. “I lost 25 pounds freshman year just from double practices, swinging from JV to varsity, four hours a night,” he said. While he was shedding the pounds, Wood was also absorbing all he could from his elders. His chief mentor was then-senior starting center, Anthony Owens, now a sophomore at the University of Maine-Farmington. Wood sets a high standard for the rest of the Ramblers with his work ethic alone, MacArthur said. “He’s got that special attribute of working on his craft. Behind the scenes, he probably puts more work into his game than anybody else,” MacArthur said. Wood’s plans to improve last summer got sidetracked by a foot fracture suffered playing AAU basketball. But rather than lament his lost opportunity, he saw it as a chance for his teammates, many of whom had to become major contributors with eight seniors graduating, to grow. “I was way out of shape (when he came back), but Coach got me back into it really quick,” he said. Wood’s size and strength make him tough to stop inside, and his improved footwork has made him more of a factor on both ends. 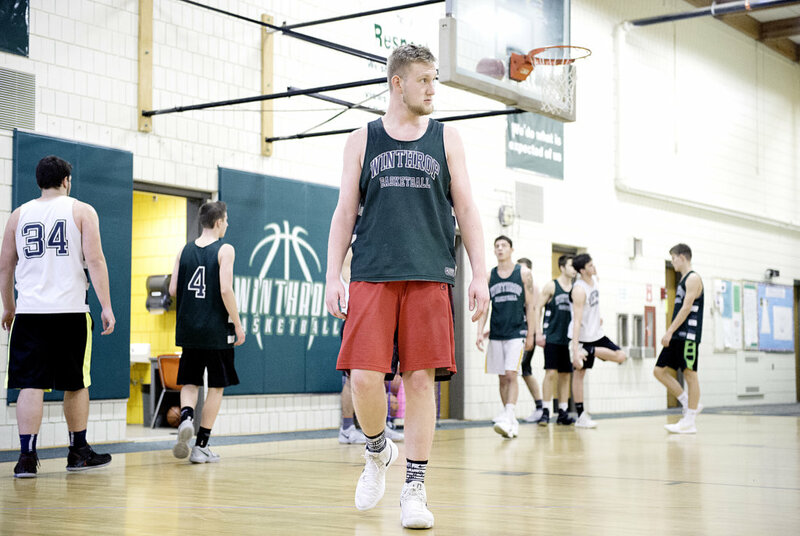 It’s also made him an increasingly rare college prospect in Maine, a true paint presence. Not surprisingly, coaches are paying close attention to his development. MacArthur is glad to have Wood for one more year after this, but admitted he’s also anxious to see how much more Wood develops in a college system. “I can’t wait to see what he’s going to become,” MacArthur said.